We are located at only 150 meters from the Central Station (all Shuttle buses from and to the airport starts from here)and at only 10 meters from the metro stop of the yellow line M3 Sondrio. From here you can easily reach every point of the city: the Duomo, La Scala, Brera, the Sforzesco castle, all major hospitals, the universities and all the movida's areas. We will be happy to give you a map of the city and all the information you need. I Am Here is the ideal solution for those looking for a comfortable and economic accommodation, whatever is the reason of your journey is. 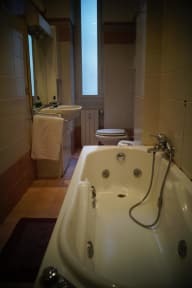 All our rooms have a shared bathroom and are equipped with: TV 32’’, WiFi connection and hairdryer. ALL THE CHECK-IN AFTER 21.00 MUST BE CONFIRMED BY US. Clean, great location and the staff were really friendly. Friendly staff. The office is just as soon as you get off metro station, but the place is still couple of blocks away, but once you know the place it is close to grand central station! Very clean and accommodation was very good! Free breakfast and snack is available! Highly recommended! I've had a very pleasant stay in the hostel. Amazing location right next to the central station. Very nicely decorated and clean throughout. Only one or two minor things - one of the shower heads was broken so there wasn't much water coming out and the front door lock of the building was fiddly and difficult to unlock at times. But I'd recommend this hostel to anyone. I can hear the voice other guest activity at the next door. It's bed and breakfast. But they only have biscotti, biscuit, jam, and coffee machine. We must check in, at another building. Breakfast is extremely unhealthy,I reckon they should change it and add fruits instead of dry crackers. 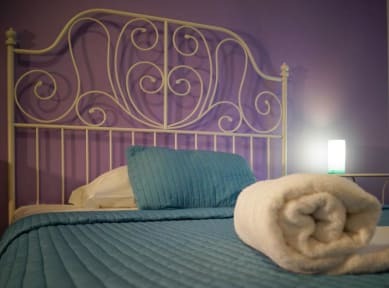 The room was stark and facilities were very basic - a lower standard than expected based on the website's description. There was no air-con, only a fan, so the room became very hot. We did not feel comfortable opening the balcony doors as security was low and the room had no other windows. The breakfast consisted of packaged croissants and jam, so not exactly a B&B as advertised. The walls were thin, the doors creaky and lots of hair on the floor. Would not stay here again despite good location. Wouldnt recommend anyone to stay at the I Am Here hostel - in particular if you expect to arrive later than 21.00. I had told the reception I was arriving late, but due to a delay I arrived an hour later than expected. When I arrived there was no one at the reception. Had to find another hotel in the middle of the night, and even though I Am Here still wanted full payment for a night where I couldnt check in and use my room. Not very understanding considering the circumstances.